Last weekend, a group of Ilyokwan students travelled up to Nottingham for the Guild of Independant Martial Arts (GIMA) conference weekend. 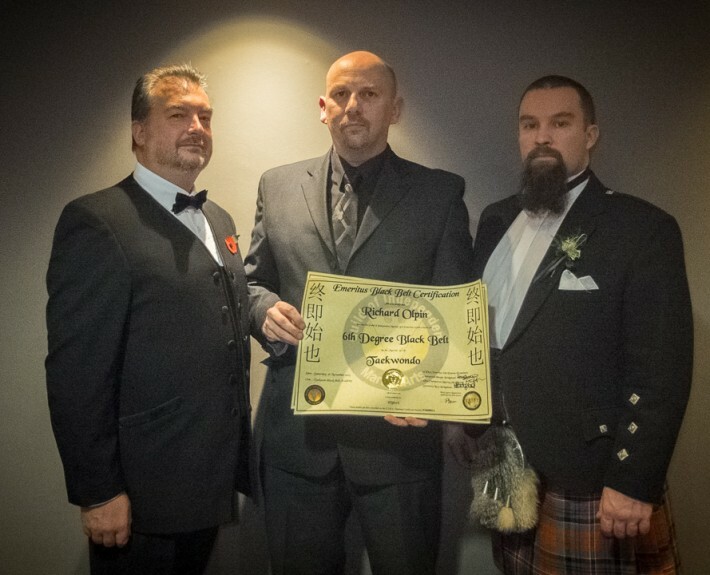 The weekend proved to be a double celebration as Master Olpin was presented with two awards: GIMA Instructor of the Year 2013, and a promotion to 6th Degree Black Belt! A personal message from Master Olpin..
I’d like to take a moment to express my gratitude and say a very special personal thank-you to everyone involved in both these nominations and to those of you who’d conspired to provide testimonials etc in support of them.. I am especially grateful to Mr Hirst and to Mr Davison who provided the nominations, and to the students who attended the event. It meant a lot to me that you were there to share such a memorable evening with me. After 30 years in the martial arts one tends to stop worrying about the number of stripes on a belt etc. As an instructor the real rewards are earned in the progress and support of your students. It means a great deal to me to know that my students appreciate what I do, that my peers and fellow instructors had such nice things to say, and that they felt I was deserving of both the instructor of the year award, and the promotion. I’m truly humbled to receive both awards, and inspired to raise my game even further to continue to earn the respect that you’ve so graciously shown me. Thank you all, and Kaizen! 4 Negative Words Great Black Belts Avoid! The most important thing you’ll ever learn in the martial arts..